All Stork Craft cribs with a manufacturing date between May 2000 and November 2008 are included in this voluntary recall. The manufacturing date can be found on the lower right hand corner of the instruction sheet which is glued on the mattress base. The cribs were sold in various styles and finishes. The manufacture date, model number, crib name, country of origin, and the firm's name, address, and contact information are located on the assembly instruction sheet attached to the mattress support board. The firm's insignia "storkcraft baby" is inscribed on the drop side teething rail of some cribs. The metal support brackets used to support the mattress frame can crack and break after stress is put upon them during incorrect installation. 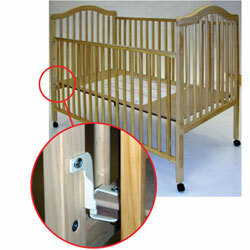 If one or more support brackets break, the mattress could potentially collapse and create a dangerous gap between the mattress and crib rails in which a child can become entrapped and suffocate. Health Canada has received one complaint in which the metal mattress support bracket failed. No injury resulted from this incident. Please note that these products meet current safety standards. This notice is posted as a precautionary measure. Stork Craft, in cooperation with Health Canada, is conducting a voluntary recall of this consumer product. For more information on safe sleeping practices for infants, visit Health Canada's Consumer Information - Safe Sleep Practices for Infants. All consumers should carefully examine the support brackets for any signs that they may be damaged. If there is reason for concern, consumers should immediately stop using the recalled cribs and find an alternative, safe sleeping environment for their baby. Consumers should not return the crib. All consumers with cribs manufactured between May 2000 and November 2008 should contact Stork Craft to receive a free replacement kit with new mattress support brackets. For more information, consumers may contact Stork Craft toll-free at 866-361-3321 anytime to order the free replacement kit or log on to the firms Web site. Approximately 494, 000 cribs were sold in Canada. These cribs were sold between May 2000 and January 12, 2009 at major retailers nationwide. Manufactured in Canada, China and Indonesia.